NASA’s New Horizons spacecraft is now 3.79 billion miles from Earth, or around 41 times the distance between the Earth and the Sun, and far beyond the orbit of Neptune. 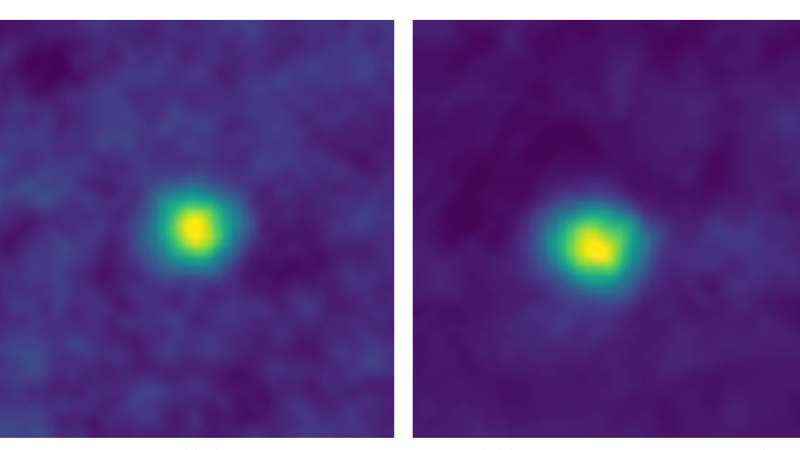 Using its Long Range Reconnaissance Imager, it snapped these images of Kuiper Belt Objects 2012 HZ84 (left) and 2012 HE85 (right)—and they’re the furthest images ever taken away from Earth. The Kuiper Belt is like an enormous and distant icy rock belt at the edge of the observable Solar System, full of dwarf planets like Pluto, Haumea, and Eris (whose mass is even larger than Pluto’s). New Horizons delivered us that incredible picture of Pluto and its heart back in 2015, and has since blasted onwards, traveling 700,000 miles a day, according to a NASA release. These images of the Kuiper Belt objects beat out Voyager 1's pale blue dot. But don’t get glassy-eyed just yet, since surely there’s more to come. The craft has since changed course to study the distant Kuiper Belt objects, and will make a close encounter with MU69 (nice) on January 1, 2019. Humans, while being just about the worst, can be pretty amazing sometimes.